Victoria Centre Observatory gets a new telescope! On July 12th Victoria Centre’s Council approved a plan to replace the telescopes currently in our observatory with new and improved optics. The Technical Committee’s plan includes replacing our existing Meade 14” SCT and Tele Vue NP 127is apochromatic refractor with a 16” F/8 Ritchey­ Chretien (RC) optical system. The new gear will be mounted on our existing Paramount ME mount, giving us a simpler setup that is actually a bit lighter than the old configuration. 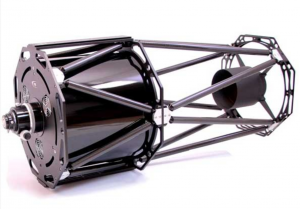 The cost of the new RC telescope and accessories will be about $14,000, depending on the US$ exchange rate. Most of the gear will be purchased from OPT Oceanside Photo & Telescope in California, since they sell their brand TPO Ritchey Chretien telescopes at very attractive prices, and we took advantage of a recent sale price. We expect to eventually sell our surplus instruments and accessories, but will keep the current setup in place until the new gear arrives and is installed, in order to maximize the availability of the VCO to members. We will fundraise from our members to directly offset the upgrade costs, since Victoria Centre Council originally budgeted $7,000 for the upgrade some months ago. We wish to enter RASC’s 150th year in 2018 with a first-rate observatory! Our target is to raise $5,000 from members over the next few months. Tax receipts will be issued for all donations. Joe Carr is our fundraiser, so please contact him for questions about the new telescope or to donate – email or telephone 250-294-1992. Bruce Lane is our Treasurer, who will issue tax receipts and account for all donations to Council and members – email. The first fundraising event was held at the RASCals Star Party on Saturday, July 29th at 2PM in Metchosin House. Thanks to everyone who donated so generously – we are already over half way to our target! Please note that proceeds of the sale of used astronomical equipment is highly variable and can take many months. RASC Victoria Centre and then all RASC members will be given first chance to purchase our surplus equipment. Please contact Joe by email or telephone 250-294-1992 if you are interested.